Rasa [Fourth Kazekage] was the father of Fifth Kazekage Gaara. It is still hard for me to believe on how Rasa was murdered easily by Orochimaru when he has powerful jutsu. He was reincarnated in the Fourth Shinobi World War and sealed off by Gaara. He is not the strongest ninja character in the Naruto Online game but is a decent character you can use for mid game between level 60-80. 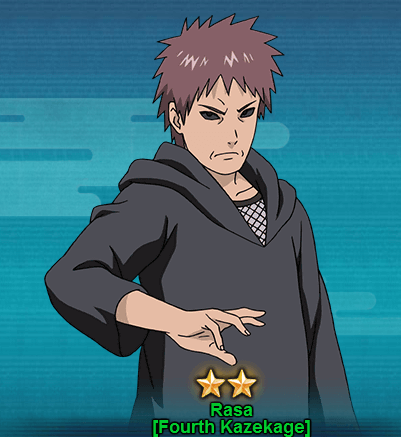 Lets take a look at Rasa [Fourth Kazekage] abilities in Naruto Online game. Ninjutsu Magnet Style – Giant Gold Dust Burial Sending [Prompt]: Causes wind and Earth attributes damage to up to 3 units of the opponent’s team, also causes Immobile. A selected target will suffer from Knockown. Taijutsu & Ninjutsu Sakin Attack: Attacks the opponent’s units in the front row and has a fixed chance of causing Low Float and Immobile. Taijutsu & Ninjutsu Light Style – Glaze Stream: Chases and Attacks Low Floated unit, causes High Float. Ninjutsu Magnet Style – Unleash Orb: Triggered with at least 20 COMBO, attacks 4 opponent’s units with Wind and Earth attributes damage, also causes Paralysis. You can get Rasa [Fourth Kazekage] from the Edo Tensei Treasure. You will need at least 170 seal scroll draws to get Rasa. However, you can also purchase Rasa with coupons and ingots in some of the events.